Here, you can find my beach glass jewelry and some of my collage and assemblage art, featuring Annie Sloan Chalk Paint ® at The Painted Bench. 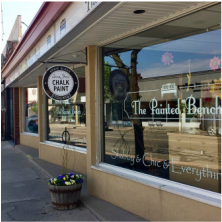 This lovely shop sells specialty paints, including Annie Sloan Chalk Paint and Miss Mustard Seed Milk Paint, an array of decorative painting accessories and tools, home decor items and other accessories. It's such a fun place to visit: give yourself plenty of time to browse all the great stuff. And sign up for a workshop while you're at it. Monday to Wednesday: 10 a.m. to 5 p.m. In the delightful village of St. George, you'll find this shop that truly lives up to its name: you can find everything from antiques and collectibles to handmade soaps and stained glass. I have beach glass jewelry and some upcycled creations available for sale at this eclectic shop, which locals call "The Vault". Sunday to Monday: 11 a.m. to 5 p.m.
​Tuesday to Saturday: 10 a.m. to 5 p.m. If you are interested in commissioning artwork or a custom piece of jewelry, please contact me at jane@janekoopman.com. I'll gladly accommodate requests for stamp art of specific countries, provided I can source the appropriate stamps (which usually isn't a problem).